November 10, 2015 – New York, NY. Sisense, the leader in simplifying business analytics for complex data, today announced that it was ranked 6th in the 2015 Deloitte Technology Fast 50, a ranking of the 50 fastest growing technology companies in Israel. Sisense’s impressive 1,662% revenue percent growth over the last four years propelled the company to this award. Sisense gives its customers the power and independence to prepare, analyze, and visualize complex data sets. Sisense’s expertise in complex data includes both large data sets and data derived from multiple, disparate sources. The company’s proven ability to deploy with minimal data preparation effort from an IT organization is a key driver of its market momentum. 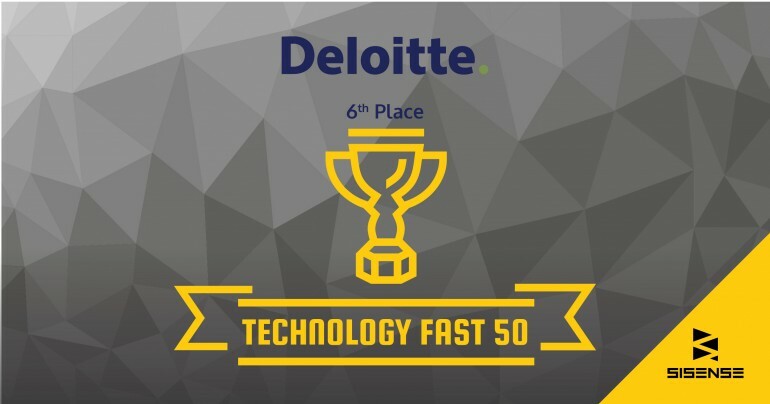 The Deloitte Technology Fast 50 is a leading technology award program, which ranks a country’s fastest-growing technology companies based on their growth percentage over the last four years. The Fast 50 program honors business growth and technological innovation as well as entrepreneurial spirit. The “Technology Fast 50” is part of a national and international program run by Deloitte. Qualified entrants will be promoted to the “EMEA Fast 500” (Europe, Middle East & Africa), and for the first time ever in 2015, to Deloitte’s Global Technology Fast 100 competition. This recognition builds on a string of awards Sisense received this year, including: Ventana Research’s 2015 Information Technology Innovation Award for Business Intelligence; Frost & Sullivan’s Customer Value Leadership Award for BI; and Celestica’s Total Cost of Ownership Supplier Award. Sisense continues to experienced rapid growth, doubling the size of its business in the last 12 months. The company boasts more than 700 global customers in a diverse range of industries including financial services, retail and healthcare. Learn more about Deloitte’s Fast50, and see the full ranking here. Sisense simplifies business analytics for complex data. Powered by its unique In-Chip™ and Single Stack™ technologies – Sisense delivers unmatched performance, agility and value, eliminating much of the costly data preparation traditionally needed with business analytics tools and providing a single, complete tool to analyze and visualize large, disparate data sets without IT resources. With more than one thousand customers in over 50 countries, including global brands like Target and Samsung, Sisense was recently designated a hot company to watch by CIO, CRN and Information Management and recognized as one of the "10 Most Innovative IT Ventures" at Under the Radar. Its solution won the "Audience Choice" award at the O’Reilly Strata conference and its CTO won the World Technology Award for the invention of In-Chip™ analytics.